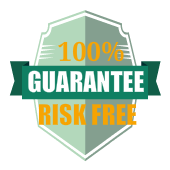 During our free consultation, we survey the problematic areas of your property. 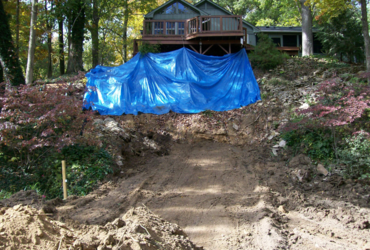 Our trained expert develops a plan to correct the erosion problem. 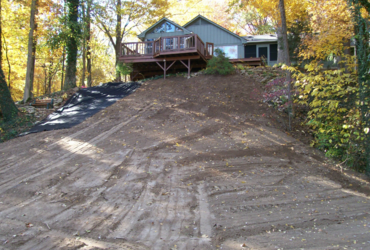 Erosion is controlled by the installation of new soil or an erosion control fabric. We also recommend to burying drain tiles or down spouts to prevent erosion problems near your structure. 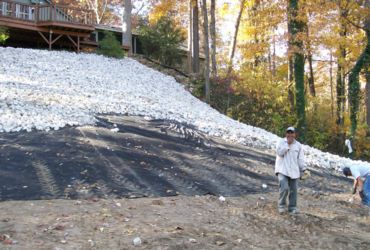 Erosion control along a lake, ditch, or hillside may require the installation of specialized fabric and rip rap stone. First, a defined edge is cut on the top of a lake, ditch or hill side where the erosion and the turf meet. Second, a geo textile fabric is applied. This serves as a weed barrier. Third, rip rap stone is placed over the fabric. This directs water for proper drainage. 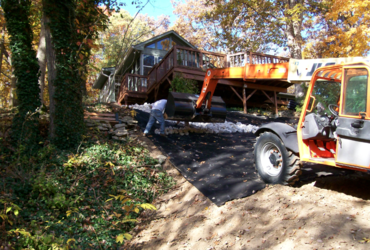 When it rains, the rain will go through the rip rap rocks and drain on top of the fabric to a desired location for effective drainage. Rip rap stone is a limestone that varies in size from 6-18 inches. 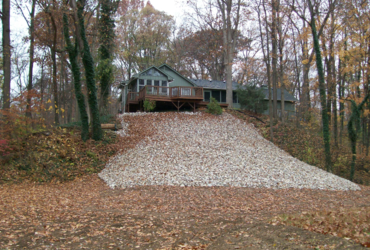 Rip rap stone not only secures the fabric, but also adds aesthetic value to your property.